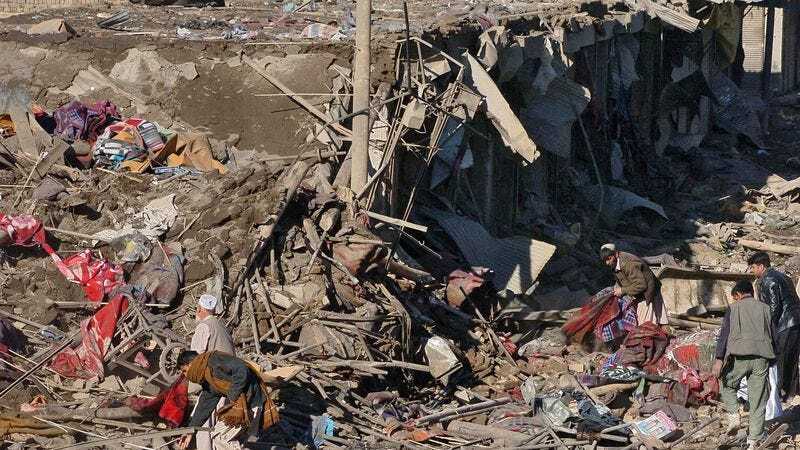 KABUL, AFGHANISTAN—Following weeks of careful planning, NATO officials revealed Monday that an airstrike had successfully destroyed a vital Taliban day care center in eastern Afghanistan, killing over 45 Taliban babies and toddlers. “I can confirm that on Sunday, coalition forces carried out an attack on a nursery school of considerable strategic importance,” said a spokesman for NATO’s International Security Assistance Force, adding that 11 high-priority 2-and-3-year-old targets were killed during the operation. “The facility was believed to have housed a supply closet containing diapers and snacks, as well as several playrooms and a large nap area. We made sure we ordered the strike during playtime so that we could eliminate targets both in the building and those who were outside running around on the playground with their friends.” The airstrike reportedly marks the second successful military siege against rebel forces this month, after last week’s successful bombing of a key Taliban soccer game.